The quilt is beginner-friendly if you cut with care, sew accurate quarter inch seams, and press thoroughly but with precision. Beginning quilters should read the linked tutorials and pay attention to measurement advice. The block's nine patch center requires a bit different assembly method than we've used in our other Bento Box patterns, and it has more levels of strips (in different widths) surrounding the center. Not sure how to print the patterns? Learn the best method. Finished block size: 15" x 15"
The quilt blocks are strip pieced. The quilt can be scrappy but do try to choose fabrics of similar color value (contrast) within each fabric designation. Label your fabrics. Photos of the block begin on page 2 and you can see the entire block on the last page of the pattern. Fabric descriptions match the block, not the quilt pictured above. Cut the following fabrics to make 20 nine patch centers for the quilt blocks. Grab two 2-1/2" wide x selvage width Fabric 4 strips and sew them lengthwise to opposite sides of a Fabric 1 strip. Press (as sewn) to set the seams and then press seam allowances towards the (inner) Fabric 1 strip. The strip set should be 6-1/2" wide. The middle strip should be 2" wide along its entire length and the outer strips should each be 2-1/4" wide. Create another identical strip set by cutting and sewing together (2) 2-1/2" x 17" strips of Fabric 4 and a Fabric 1 strip of the same size. Square up one end of each strip set. Cut a total of (20) 2-1/2" A segments. Sew a 2-1/2" x selvage width Fabric 1 strip lengthwise to each side of a Fabric 4 strip of the same size. Set the seams. Press seam allowances towards the Fabric 1 (outer) strips. Check for accuracy -- strips should be the same width as the A strip sets, depending on their position. Make another identical strip set. Repeat one more time, but use (1) 2-1/2" x 26" Fabric 4 strip and (2) 2-1/2" x 26" Fabric 1 strips. Square up one end of all strip sets. Cut a total of (40) 2-1/2" B segments. If your strip sets did not produce enough segments, sew shorter strip sets from remaining yardage and cut more segments as needed. Do the same if necessary for any of the remaining steps. Pair one A segment and two B segments to create the three rows of a nine patch quilt block. Sew the rows together and press seam allowances any direction. The nine patch block should measure 6-1/2" x 6-1/2". If your nine patch is not accurate, try one of my quilt block squaring up techniques. Nine patches are the foundation of your larger quilt block and must be accurate for best results. Make 20 nine patch quilt blocks. Sew a long Fabric 3 strip to a Fabric 5 strip of the same size. Press to set the seam, and then press the seam allowance towards Fabric 3. Check widths. The strip set should measure 6-1/2" wide along its entire length. Individual strips should each measure 3-1/4" wide. Use remaining strips to make two more strip sets (one will be shorter). Square up one end of each strip set. Cut a total of (40) 2-1/2" segments. Find a 6-1/2" x 6-1/2” nine patch quilt block. Place a C segment (vertically) along the left side of the nine patch, with the Fabric 3 portion of the segment sticking upwards as shown. Place the second C segment (vertically) along the right edge of the nine patch, but flip the segment around so that Fabric 3 is down (aligned with the bottom edge of the nine patch). Sew the two segments to the nine patch. Press seam allowances either direction. The partial block should be 6-1/2" tall and 10-1/2" wide. Repeat to add two C segments to each nine patch quilt block. Scrap Quilters: You might prefer to arrange all segments for blocks on a large design wall to create more layout flexibility before sewing anything together. Sew a long Fabric 3 strip lengthwise to a Fabric 5 strip. Yes, this strip set looks like strip set C, but remember that strips are different widths. You'll see more of that moving forward in the pattern. Press to set the seam and then press the seam allowance towards Fabric 3. The strip set's total width should be 10-1/2", and the width of individual strips should be 5-1/4" each. Repeat to make two more strip sets from remaining fabrics (one will be shorter). Square up one end of each strip set and cut a total of (40) 2-1/2” segments. Place a D segment (horizontally) above the partial block from page 3. Fabric 3 should be to the left. Place the other D segment (horizontally) below the partial block, with the Fabric 3 strip aligned to the right. Sew each strip to the block and press seam allowances towards the D segments. The block should measure 10-1/2" x 10-1/2". Sew D segments to all 20 blocks. Sew a long strip of Fabric 2 lengthwise to a Fabric 4 strip of the same size. Press to set the seam and then press the seam allowance towards Fabric 4. The strip set should be 10-1/2" wide along its entire length; each half of the set should measure 5-1/4" in width. Make a second strip set from the shorter lengths of Fabrics 2 and 4. Square up one end of each strip set. Starting from the squared up ends, cut a total of (40) 1-1/2" segments. Align one E segment along the left side of the partial block. The Fabric 2 portion of the segment should be even with the top of the partial block as shown. Place the second E segment along the right side of the block, but flip it around so that Fabric 2 is positioned along the block's bottom edge. See photo. Sew each E segment to its side of the block and press seam allowances either direction. The partial block should measure 10-1/2" x 12-1/2". Repeat to add all remaining E segments to the 20 quilt blocks. Sew a long Fabric 2 strip to a Fabric 4 strip of the same size. Press to set the seam. Press seam allowance towards Fabric 4. The strip set (F) should measure 12-1/2" wide along its entire length. Individual strips should be 6-1/4" wide. Make another (shorter) strip set from the 25" long strips. Square up one end of each strip set, and then cut (40) 1-1/2" segments. Sew one segment (horizontally) along the top edge of the block, with Fabric 2 on the left side as shown. The images are getting large -- the photo on this page shows strips already sewn to the block. Sew another segment below the block, horizontally, with Fabric 2 positioned to the right. Press seam allowances either direction. Repeat for all 20 quilt blocks. G and H strip sets for the quilt blocks look very much alike, but the strips used to make H units are wider. Only one strip set is illustrated. Sew a 6-1/2" x selvage width Fabric 1 strip lengthwise to a Fabric 5 strip of the same size. Press to set the seam and then press seam allowance towards Fabric 1. The strip set should measure 12-1/2" wide along its entire length. Each half of the strip set should be 6-1/4" wide. Make another strip set from remaining fabrics. Square up one end of each strip set, and then cut a total of (40) 2" segments. Refer to the photo, bottom left. Sew one G segment (vertically) to the left of the partial block. Fabric 1 should be at the top left corner. Sew another G segment (vertically) on the opposite side of the block, with Fabric 1 in the bottom position as shown. Press seam allowances either way. Sew an 8" wide x selvage width Fabric 1 strip lengthwise to a Fabric 5 strip of the same size. Press to set the seam, and then press the seam allowance towards Fabric 1. The strip set should measure 15-1/2" wide along its entire length. Individual strips should be a consistent 7-3/4" wide. Use remaining strips to make a second strip set. Square up one end of each strip set and cut a total of (40) 2" segments. Sew one segment along the top of the block, with Fabric 1 on the left as shown in the photo, bottom right. Sew another F segment to the bottom of the block, placing it in the opposite position (Fabric 1 to the right). The quilt block should measure 15-1/2" x 15-1/2". Repeat to make a total of 20 quilt blocks. That's it! 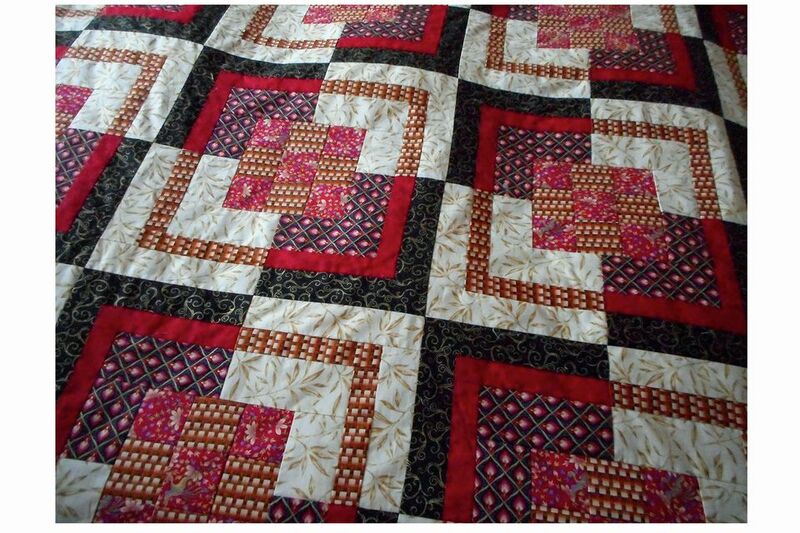 The blocks can be sewn side-by-side after arranging them into five rows of four blocks each, but your quilt can differ. You might want to add borders, place the blocks on-point, or split the blocks and make two smaller quilts.